It's time to stop and take in the wonder of this time of year so I'm going to step away from the blog over Christmas and join you again closer to New Year. In the midst of Christmas mayhem and preparations may we keep our eyes and hearts focused on the Christ in Christmas, remembering that His eyes are forever on us and His love is being poured unceasingly into our hearts. How blessed we are. 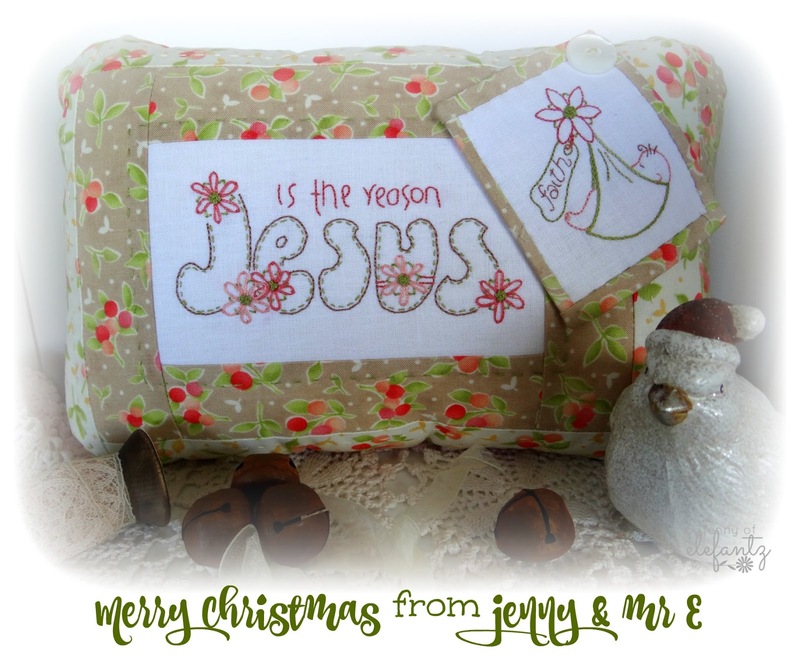 If you'd like to stitch the designs on my Christmas pillow they are free to download HERE until December 26th. Merry Christmas to you and yours, Jenny. Thank you for all your love and wonderful posts and patterns throughout 2015! So very generous of you. May you and your family have a Blessed Christmas. Jenny may you and your family have a Very Merry Christmas! Will be looking forward to hearing all about. Merry Christmas to you and yours. I hope this season fills you with peace and joy. Thank you for all you do and share with us out here in blog land. Merry Christmas, Jenny. I pray peace and love for you and your family members. Thank you for one more free pattern. Amen! And Merry Christmas to you and yours. God Bless and may 2016 smile on you. Jenny, may you and your family have a very blessed Christmas. Thank you for your beautiful pattern. Es una almohada preciosa. Feliz Navidad para tí y para toda tu familia. Gracias por el diseño.Besos. Wishing you and your dear family a wonderful Christmas with an abundance of peace, love and joy throughout the coming new year. Many angel hugs and blessings. Have a blessed Christmas with those you love Jenny I look forward to you return in the new year. Thank you for all your wonderful free patterns. Wishing you and yours a blessed Christmas. Merry Christmas to you Jenny, and to your family. Thank you for all the beauty you share with with all of us: the stitchery items as well as your uplifting words. God Bless. Thank you for letting us in your little part of the world with your designs and words of encouragement! Merry Christmas to you and your family! Enjoy the day! Love your blog and all that you share with us. You are so kind to share all that you share. Love seeing your photos of Queensland. Have a super great Christmas Season! Merry Christmas to you and thank you for the beautiful pattern. Merry Christmas to you and your family. I want to tell you how much I enjoy your designs and your blog. I am a former home economics teacher . I love your color sense and look forward to reading more of your blog in the New Year. Thanks so much for the joy you bring me. Many thanks for all your most generouis gifts throughout the year! Happy Christmas to you Jenny and to all those you hold in your heart. Merry Christmas and thanks for a wonderful 2015. Merry Christmas Jenny! You are so generous with your designs! Wishing you and your family a wonderful Christmas! Feliz Natal, Jenny! Que Deus continue te abençoando e a sua família! en unión de tu familia y amigos.